Goods ordered in error, surplus to requirements or unsuitable may be returned to us within 30 days of receipt. Goods will be refunded on the condition that they have not been used, fitted and are undamaged in the original packaging with fixings. This excludes special order or made to measure items. 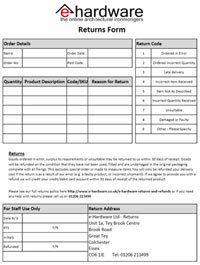 Please download and complete the e-Hardware Returns Form and include it with your return. If for any reason you are unable to print the returns form please ensure that you include all relevant information with your return. Generally the buyer pays return postage, we can arrange for a collection or if you wish to use your own courier we recommend using Royal Mail for smaller items or myHermes for larger parcels. Goods will be refunded on the condition that they have not been used, fitted and are undamaged in the original packaging with fixings. You will only be refunded your delivery cost if the return is as a result of our error (e.g. a faulty product, or incorrect shipment). If we agree to provide you with a refund we will credit your credit/debit card account within 30 days of receipt of the returned product. You may cancel your order at any time prior to the order being dispatched. If you have notified us of a problem with the goods, we will either make good any shortage or non-delivery; replace or repair any goods that are damaged or defective upon delivery; or refund you the amount paid for the goods in question. We will not be liable to you for any loss of profits, administrative inconvenience, disappointment, indirect or consequential loss or damage arising out of any problem in relation to the goods. We shall have no liability to pay any money to you by way of compensation other than any refund we make under these conditions. This does not affect your statutory rights as a consumer.